Interested in a Von Marc Puppy? 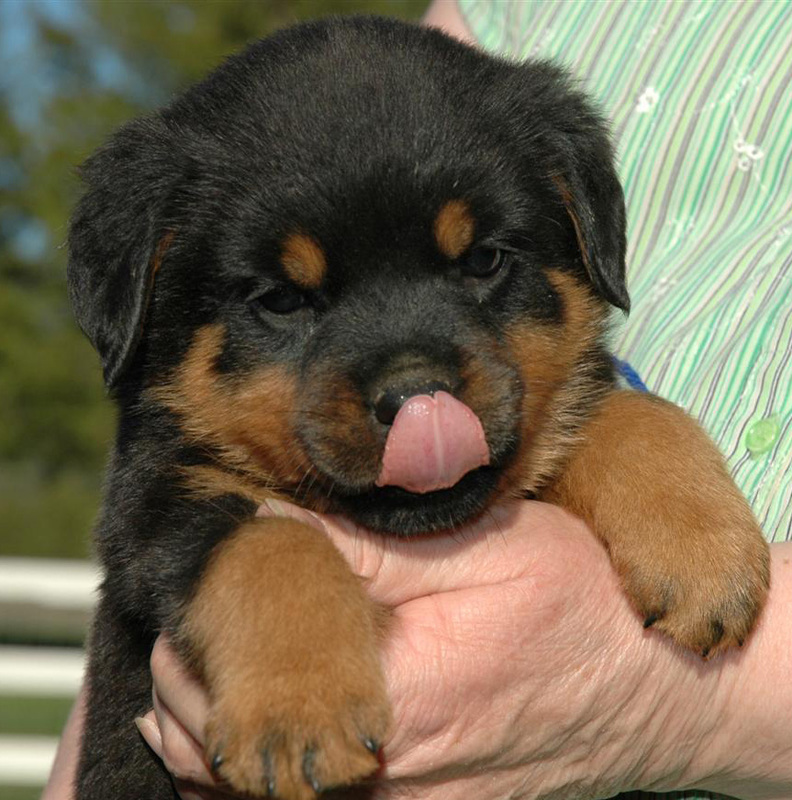 Is a Rottweiler the right dog for you? So You Think you want a Rottweiler? Contact us via email or phone. We ask that you fill out our Puppy Questionnaire on this site so that we may have some background information on you. It contains questions pertaining to your lifestyle, your previous dog experience, if you are looking for a pet companion or a show potential puppy. Our pups are spoken for well before they are born. Our contracts (Pet Companion and Show Potential) are on our Litters page so that you can review them prior to requesting to be put on our waiting list for a puppy. We encourage you to ask any questions you might have about them. Please understand, we do not sell guard dogs or breeding Rottweilers; we offer wonderful pet companions and allow breeding rights to certain show dogs which must be titled and have health certifications prior to being bred. Just because you show up with money in your pocket does not guarantee you a Von Marc puppy. We co-own all of the puppies we sell until all the terms of their particular contract (our contract links are above) have been met. We are more than pleased to provide references from those who have purchased from us in the past and from fellow breeders. 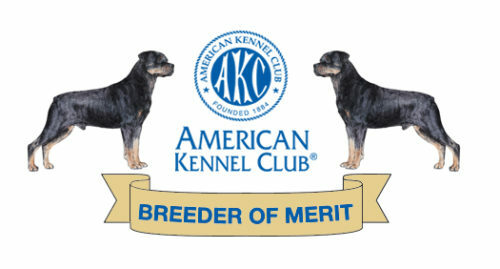 We base our breeding program on good ethics, our intent to maintain our breed standard and the protection of our breed against back yard breeders who breed with no thought to temperament or health standards. As you are searching for a puppy be aware of those who tell you that health testing for hips, elbows, eyes, JLPP and hearts is unnecessary or that their dogs do not have such problems. Don’t be led astray to believe that these health problems are not pervasive in our breed, that is why health clearances were adopted by all ethical breeders. We are members of the American Rottweiler Club, the Colonial Rottweiler Club, the Medallion Rottweiler Club, the the Rottweiler Club of Alaska and the Mt. Rainer Working Dog Club. The websites for these organizations are excellent sources of information regarding Rottweilers and Code Of Ethics Breeding. Once we have received your questionnaire and have placed you on our list, we encourage you to keep in touch with us for updates. We try to post updates on our website as often as possible and once puppies are born, we will post photos of the puppies every 7 – 10 days. The puppies are graded for structure and temperament tested at 7-8 weeks of age. At that time, we make our final decision on which puppies will be rated as pet companions and which ones will be chosen as show quality. For this reason, we may not be able to tell you if you will be getting a puppy until they are least seven weeks of age. We normally keep our puppies until they are 9 – 10 weeks of age before releasing them to their new homes. We do not take deposits on our puppies. We do not believe you should have to be “tied” to any particular breeder because they require a non-refundable deposit. If we know we will not have a puppy for you in the time frame in which you desire, we are more than willing to help you to find a puppy from another breeder that we would recommend. After spending the initial eight weeks with the puppies, and then doing a formal evaluation of their temperament and structure, we have a very good understanding of what each puppy is like in both respects. Some people want to choose their pup themselves, in most cases we do not allow this. The best advice from most breeders is that first of all, you do your research to pick a breeder that you trust and then you trust the breeder to place the right puppy with you. If there is no pup available, you will have the option of carrying over your reservation to a future litter. To us, there are no first, second, etc. “picks” in a litter. No two homes are exactly alike; each family has a different ideal puppy. By us choosing the home for each puppy, every client gets the pup best matched to them, so everyone gets “first” pick, best suited for their home and for what they want to accomplish with the puppy. Puppies are ready to go home at 8 – 10 weeks of age. When you come to pick up your puppy, don’t expect to breeze in and out in 15 minutes. This process takes time. Even though you will have received a contract prior to this date and have had time to ask any questions about it, we will once again go over the contract to make sure you fully understand your obligations (and our commitment) to it. Our relationship doesn’t end once you take your new puppy home with you. We will be available to answer questions, enjoy your brags and provide assistance for the lifetime of your dog. We hope you will keep in touch with us for as long as your Von Marc companion is with you. Take your time and do your research. Whether you choose to purchase a puppy from us or someone else, we are happy to take the time to educate you about the breed so that you may make an educated and informed decision when choosing your puppy. If we can provide you with information, please feel free to email (vonmarcrotts@gmail.com), call us at 208.660.0589 or visit us on our Facebook page (Sharon Marples).